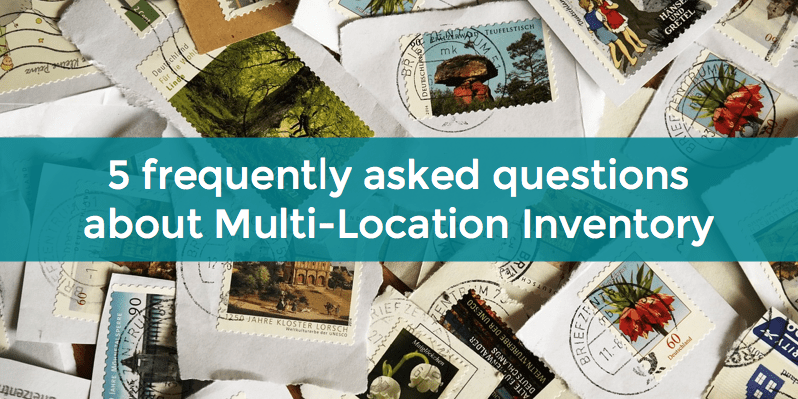 While the plugin is rather complex and has a number of not-so-obvious features, we have shortlisted five FAQ’s we often hear from Multi-Location Inventory users. 1. Can I split inventory on the Store View level? As we explain in the video above, we consider Websites (as applied to Magento) separate stores that are stocked up from separate warehouses. That is the reason Multi-Location Inventory allows you to split the inventory on the Website level. As for Store Views, “views” is the keyword here. They are different perspectives your store can be viewed from. Store Views are normally used to create multi-lingual versions of a Website or so-called themed stores, e.g. a store that sells Halloween costumes. Therefore, we see no point in creating separate inventories for Store Views, because they are simply versions of a Website, not separate websites. That said, Multi-Location Inventory allows you to split the inventory on the Website level. 2. Does your extension create an index of its own? Absolutely not. Unlike some other solutions, Multi-Location Inventory does not create any new indexes in your Magento. It works with the current index you have. So, if you ever decide to either temporarily switch off the module, or to uninstall it altogether, your inventory will simply revert to the bulk state. Let’s say, if you used to have 5 items in Website A and 5 items in Website B, the inventory for this product will get the value of “10” after you revert – for all Websites and all Store Views. 3. What if there is a conflict? If you suspect that Multi-Location Inventory is in conflict with another third-party Magento extension or a theme in your store, here are some “first-aid” steps you can take. Make sure you have the latest stable version of the module and that this version is compatible with the version of your Magento. 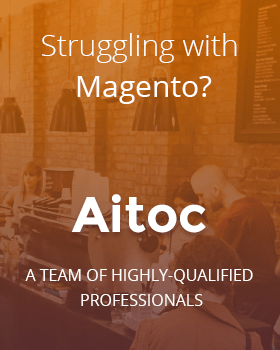 Go to System > Manage Aitoc modules and disable our module. Then clear the cache and see if the issue persists with the module switched off – just to make sure it’s really our extension that’ is causing the problem. Alternatively, in System > Manage Aitoc Modules, you can enable our Automatic Conflict Resolution System by going to Manage Class Rewrites and clicking “Enable”. If this still doesn’t resolve the conflict, try changing the rewrites order. And of course, you can always contact our support team and ask any extension-related question. Did we mention we have free email support for life? 4. Can I still update inventory attributes in bulk if I have Multi-Location Inventory installed? Yup, you absolutely can. As we say in our video, Multi-Location Inventory support Magento’s attribute update feature. This means you can go to Products, check the products you wish to update, choose “Update attributes” from the dropdown on the right and click “Submit”. Then you can open the Inventory tab (remember to specify the Website you are updating the inventory for!) and change inventory parameters there. For example, you can disable backorders for a whole number of products on one Website, and still have them available on another one. 5. Can I import/export stock levels AS USUAL with Multi-Location Inventory? Sure thing. Multi-Location Inventory supports Magento’s native import/export functionality. Besides, it lets you manage inventory attributes (i.e. update stock per website and retrieve stock data) with help of Magento SOAP API v1, v2. Let’s consider an example when we use a minimum set of the attributes: “sku”,”qty”,”store” and “use_default_website_stock”. Go to System > Import/Export > Dataflow – Profiles and click “Add new profile”. In “Entity Type”, select “Products”. In “Direction”, select “export”. Also remember to set the “Store” option to the appropriate Store View or choose “Default Values”. 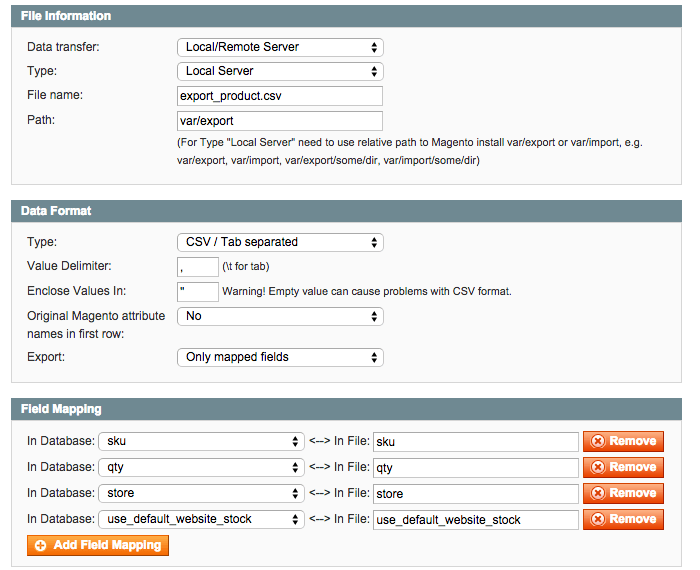 Then in “Data Format”, let us choose “CSV”, and in “Export”, let us select “Only mapped fields”. Hit “Save and continue”, and go to the Run profile tab on the left and click “Run profile”. Once the process is finished, the file with the exported data will be located in the path you specified while creating the profile. In the exported file, pay attention to the “use_default_website_stock” attribute. “0” tells the system that a particular product uses its own inventory at the given website level, meanwhile “1” means that it’s assigned “Default Values”. Let’s suppose we want to import stock information for a particular Website. Also, let’s suppose we want to use the .csv file we exported at the previous step. To get started, open the exported .csv file with Notepad or Open Office (as Microsoft Excel sometimes corrupts the data when saving it in .csv). Find the “qty” related data and modify it according to your needs. If you’d like to reassign stock item(s) to another Website, make changes to the “store” column with the corresponding identifier of that Website. You can see the identifier in System > Manage Stores. The identifier you need is next to the “Code” option. If you want to link all product inventory attributes to “Default Values” at the given Website level, set “use_default_website_stock” to “1” (or leave it blank). Otherwise set it to “0” – in this case all inventory attributes of the product will have their unique values and won’t be anyhow synchronized with “Default Values”.